With Christmas only weeks away, many businesses are starting to wind down for the holiday break between Christmas and New Year. 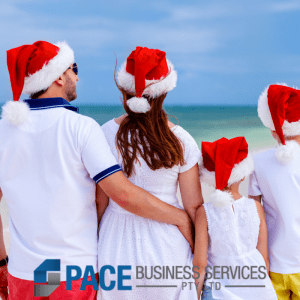 CEO’s, Managers and staff will be thinking about the holidays and their travel destination of choice to have that much needed break at the end of the year. Before you get to that stage, why not make plans for a healthier approach to 2019 for your team and how you are going to make an impact with your business in Geelong moving forward. Get a jump start into the new year by putting your plans in place now so that the holiday you’re dreaming about will be stress free. If you are looking for a serviced office to grow your business in Geelong, now is the time to make an appointment with PACE Business Services for a guided tour of our modern and professional offices based in two convenient locations in the Geelong CBD. With work/life balance reported as being the top most important attraction for employees, companies providing a local office for staff living in regional Geelong greatly increases the likelihood for retaining valuable staff members. Also, the inherent benefits that come with working in a professional environment and the networking opportunities for your business to connect with the local business community and grow organically. The start of the calendar year when staff have had a break and are refreshed and ready to dive back into work is a great time to head start on projects. With a much shorter commute to their locally based office within a professional business community, your staff will be motivated, productive and able to maintain a healthier work/life balance throughout the year. If you are ready to take your business to the next level in 2019, contact us now for a free guided tour.